As I write this we are STILL eating Easter leftovers. My Saturday afternoon panic (“OMG, will we have enough food? !”) was totally unnecessary and my family well and truly pulled out the stops. After the beef salad, my other main contribution was this chocolate torte from a BBC Easy Cook magazine dated November 2014. I bought this at Manchester airport before a flight home – my purchasing decision driven by the fact that it was the cheapest of the food magazines available (which is pathetic as English magazines are generally embarrassingly cheap) and it had James Martin on the cover. For the past 18 or so months, it’s sat by the side of the bed and been flicked through but never used. 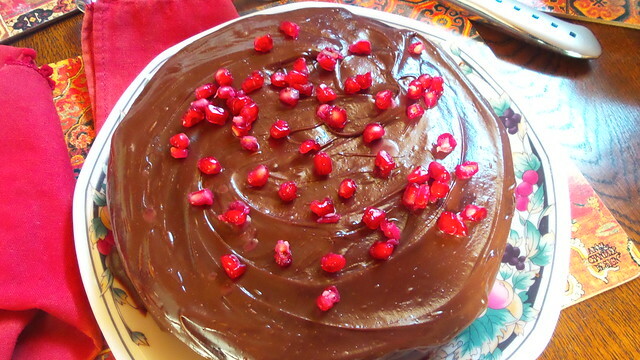 This recipe is illustrated by said chocolate torte liberally scattered with pomegranate seeds. As my parents’ tree is going nuts, and everyone in my family likes chocolate (particularly my dad and uncle who are the most vocal about it) I figured it would be a winner. You can find the recipe on the BBC website where it seems it was first printed in BBC’s Good Food magazine 12 months before being reused in Easy Cook! On account of not having any light muscovado sugar to hand, I subbed in dark brown sugar but for the remaining ingredients I did as I was told. However, some of the timings in the recipe were a bit off. Beating the eggs & sugar (in a stand mixer, no less) took longer than the 5-8 minutes suggested. The cooking time was similarly optimistic and I had the cake in the oven for an hour. That may be because my spring form tin is slightly smaller than 23cm – its diameter is not marked and I’m not sufficiently bothered to find a tape measure! There was plenty of topping so any helpers who like to lick out bowls are well served with this recipe. And being light on flour, it keeps excellently. It’s not the quickest cake to make (beating, beating, beating) but this is definitely a cake that will be made again. Preheat oven to 180°C (160°C fan). Grease a 23cm springform tin and line the base. Melt butter and chocolate. I always do this in the microwave on 30 second bursts, but you can also use a bain-marie - it will just take a bit longer! Crumble the sugars to remove any lumps (particularly important if you are using dark brown sugar) and then add to the bowl of a stand mixer along with the 5 eggs. Beat until thick, mousse-like, pale and doubled in volume. This takes a long time but once the sugar and eggs are combined you can up the speed a bit. Gently pour the melted butter and chocolate down the side of the bowl and fold in. Do this thoroughly - until the mixture is even in colour - it takes a while and it will feel like it is never going to happen but it will eventually! Sift over the almonds, flour and a ¼ tsp salt and fold in. Pour into the prepared cake tin and bake until done. The original recipe says 30-35 mins but this wasn't enough for me - I needed an hour - although I do suspect my cake tin is slightly smaller than 23cm. The cake will rise and the top will be set. As this is squidgy, a skewer inserted in the cake will come out slightly moist with some crumbs attached. Cool the cake in its tin on a rake (it may sink and/or crack). To make the ganache, bring the cream to the boil on the stove and pour over the roughly chopped chocolate and icing sugar (always make sure to sift this). Leave for 5 minutes and then stir until all the chocolate is melted. Leave to cool and thicken (I ended up putting this in the fridge) before spreading over the cake. Sprinkle with pomegranate seeds and serve with cream.